Yesterday Google officially launched their much anticipated NFC-payment system, Google Wallet. Unfortunately, a Citi MasterCard or a Google PrePaid card were the only payment options available. 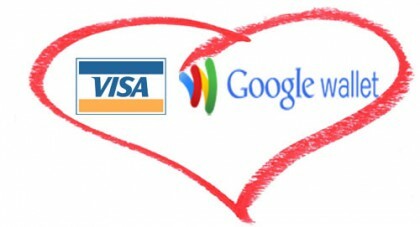 However, less than 24 hours after launch, Visa has now partnered with Google and will be joining the Google Wallet Team. Their debit, credit and prepaid cards will now be linkable to Google’s new service. The only ones left out of the party are now Discover and American Express, however Google has said they could be added in the future. Visa’s full press release can be found after the break. SAN FRANCISCO–(BUSINESS WIRE)–Visa Inc., Visa Europe and Google today announced that Google has received a worldwide license to Visa payWave, an innovative NFC-based payment technology. Visa payWave enables consumers to make fast and secure payments at retail locations by waving their mobile phone in front of a payment terminal and is currently accepted at hundreds of thousands of retail locations worldwide. The agreement sets the stage for Visa-issuing banks worldwide to enable Visa account holders to add their credit, debit and prepaid accounts to Google Wallet – a mobile application that turns a smart phone into a digital wallet. This is the latest effort by Visa and Google to simplify the consumer shopping experience by enabling them to make mobile payments using their mobile phones. Today’s news furthers Visa’s progress in making its products available as a payment option in any digital wallet. This includes Visa’s own digital wallet announced earlier this year which is designed to provide consumers with “click-to-buy” payment functionality and access to their Visa and non-Visa accounts using a personal computer or smart phone, to make purchases online and at retail locations. Google Wallet is designed to enable an open commerce ecosystem enabling consumers to carry payment cards, offers, loyalty and gift cards — and eventually much more. Google is also working with top retail brands to create a new mobile shopping experience. Visa is a global payments technology company that connects consumers, businesses, financial institutions and governments in more than 200 countries and territories to fast, secure and reliable digital currency. Underpinning digital currency is one of the world’s most advanced processing networks—VisaNet—that is capable of handling more than 20,000 transactions a second, with fraud protection for consumers and guaranteed payment for merchants. Visa is not a bank, and does not issue cards, extend credit or set rates and fees for consumers. Visa’s innovations, however, enable its financial institution customers to offer consumers more choices: Pay now with debit, ahead of time with prepaid or later with credit products. For more information, visit www.corporate.visa.com.